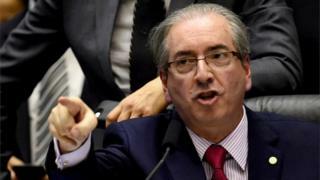 Police in Brazil have raided the official residence of the speaker of the lower house of congress, Eduardo Cunha. Several police cars surrounded the house in Brasilia early on Tuesday. Mr Cunha's property in Rio de Janeiro has also been raided, police officials said. The officers are searching for evidence in connection with a corruption scandal at the state-oil giant Petrobras, which has cost the company $2bn (£1.3bn). Prosecutors filed charges against Mr Cunha in August. He is accused of taking $5m (£3.2m) in bribes from companies seeking to secure contracts with Petrobras. Prosecutors allege he hid the money in secret Swiss bank accounts. Mr Cunha denies the allegations and says they are politically motivated. He has refused to step down from his post as speaker. Mr Cunha is an outspoken critic of President Dilma Rousseff. In July, he left the governing coalition and two weeks ago, he opened impeachment proceedings against the president. The process is based on allegations that Ms Rousseff broke the law in managing last year's budget. However, the impeachment proceedings are currently on hold while the Supreme Court decides on the validity of the process followed. President Rousseff has denied any wrongdoing. Police officials said on Tuesday that in addition to Mr Cunha's two properties, federal officers had also searched the homes of Senator Edison Lobao and Congressman Anibal Gomes. Both belong to the same party as Mr Cunha, the PMDB. Mr Lobao served as mining and energy minister under President Luiz Inacio Lula da Silva, and more recently, under President Rousseff. Dozens of members of Congress are being investigated in connection with the corruption probe, dubbed Operation Carwash by police.